Difference between revisions of "Spotlight on Lee Falk - The WWII Years"
In Washington Lee Falk was<ref name="PM-67">Murphy Patricia, "The Toast of Paris, France: Mandrake’s Master, Mr. Lee Falk", Detroit Free Press ''(Detroit), 4 June 1967, p 44-46</ref> one of several ''dollar-a-year'' men, and his income was from his newspaper strips. In 1948, [[Phil Davis]] said<ref name="PD-48">Dale Bert (1948), Meet Phil Davis, ''[[The Open Road for Boys - February 1948|The OPEN ROAD for Boy's, February 1948]]'', 34-36. 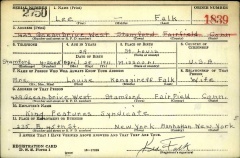 Copy: [[Interview - Meet Phil Davis by Dale Bert]]</ref> that Lee Falk did mail two or three months' supply at a time. In 1967, Lee Falk said<ref name="PM-67">Murphy Patricia, "The Toast of Paris, France: Mandrake’s Master, Mr. Lee Falk", Detroit Free Press ''(Detroit), 4 June 1967, p 44-46</ref> he created a few weeks of script for both Mandrake and The Phantom at a time, spending eight to ten hours a week on this. Even if Lee Falk probably worked long days in Washington he could continuing writing his script for Mandrake and The Phantom. Also several scripts in this period are about the war theme and intelligence, inspired by his work at OFF/OWI. Back in New York Lee Falk wrote the [[Spotlight on Lee Falk - Other writings - Passionate Congressman|Passionate Congressman]], inspired by his experiences in Washington's political environment. By the end of August 1943 Lee Falk had quit his job in Washington and back in New York he wrote the [[Spotlight on Lee Falk - Other writings - Passionate Congressman|Passionate Congressman]], inspired by his experiences in Washington's political environment. By the end of August 1943 Lee Falk had quit his job in Washington and back in New York he wrote the Passionate Congressman, inspired by his experiences in Washington's political environment.